Divide the Lucky Charms™ cereal into two bowls, one with the plain cereal and one with the colorful charms. Set the bowl of charms aside. In a large bowl, combine the 2 cups of mini marshmallows and the butter. Heat in microwave in 60-90 second bursts, stirring between, until the marshmallows are melty. Add Lucky Charms™ cereal (NOT the charms). Stir to coat. The mixture shouldn't be too marshmallowy – you just want the marshmallows to create a thin coating for the cereal. Press the cereal mixture into the bottom of a lightly greased 8x13-inch baking dish, creating a thin layer of cereal. Allow to cool and firm up. Slice into 12 even-sized squares. Remove ice cream from freezer about 5 minutes before using. Stir all but 1/4 cup of the charms™ into the ice cream. Spread ice cream between two cereal squares to form an ice cream sandwich. Press additional charms™ onto sides of ice cream if desired. Wrap each sandwich with plastic wrap. Place in fridge until firm, about 3-4 hours. Luck never tasted so good. Listen, cereal lovers. You thought a bowl of Lucky Charms was good? Just WAIT until you pair a pour of that scrumptious stuff with butter. And marshmallows. And creamy, creamy ice cream. This here is a recipe that’s about to rock your world – it may just be what cereal was meant for! And it's so easy, it’s absurd. Four ingredients. Two bowls. Everything is made in the microwave. We ain’t gonna make you work hard or wait. We take the arrival time of treats from conception to inception very seriously. Lucky Charms out! Big box, give it a pour. You’re aiming for 6 cups of Lucky Charms, but don’t panic if you get a little more or a little less. Separate the plain cereal from the colorful charms. 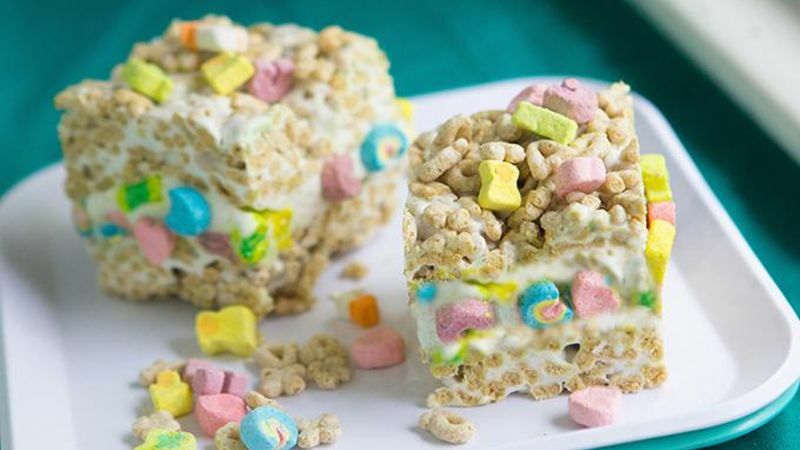 Then make a quick and easy pan of Lucky Charms crispy treats by microwaving marshmallows with butter. Mix, then press it all into the bottom of a 9x13-inch pan. Set aside until cool, then cut the sheet into 12 squares. Now mix those colorful charms into a bit of softened vanilla bean ice cream. Spread the ice cream between two cereal squares (use a knife to give each ice cream sammy a nice edge), then decorate the edges with the reserved colorful charms. Wrap and freeze until ready to serve. Once you’re ready, pull ‘em from the freezer and eat ‘em quick. Cereal and milk? Nope. Cereal and ice cream ... that's it!